The cost of putting a child through Secondary School is often an impossible burden for parents. Karatu Education Fund assists in raising funds to sponsor these children through Secondary School and if possible continue the sponsorship through Trade School or University . Above from left is Anatoly Philip with his young brother and sisters, they both lost their mother two years ago and now living alone after their father got married to another women and left them with no support. The younger children currently live on their own while attempting to successfully finish their schooling. Anatoly completed his O-level study last year and has been selected to join Agricultural college that deals with livestock and farming. If he can not pay the fees it will be given to another student if he fails to report after deadline. KEF is looking for sponsors for Anatoly College fees, as well as assisting his brothers and sisters and improving their living situation. Below is a letter from Anatoly. KEF has paid for the first year of his Agricultural college fees so that he would not be taken of the acceptance list. KEF is sponsoring David Sillo to pursue his dream to become a professional tour guide. This is a very good career choice in the area, as well as an important education learning about the importance of sustaining the local environment and wildlife.David completed his secondary education at Ganako Secondary school but did not continue with his further studies due economic situation of his parents. Many thanks to Roland and Nanette for helping him to achieve his dreams. Lilly she completed her last quarter of studies at Mbeya University of Science and Technology. We are so pleased to announce that Lilly has graduated with an Ordinary DIPLOMA in Laboratory Science and Technology (3 year program). Thanks to her sponsors Dale and Elena Jensen, A School Bell Rings (Jamie Turner), Julie and Jim Dunn, Eric and Lori Jensen, Karl and Robin Jensen, Duke and Johanna Farrell and Todd Jensen for their generosity. Abdul Hussein is currently at Imboru Secondary School and plans to complete his A level studies in 2019, we are looking for a sponsor to assist Abdul to finish his studies. He is a very hard working and high achieving student from a single parent family, and combines studies with helping his mother with the daily chores. 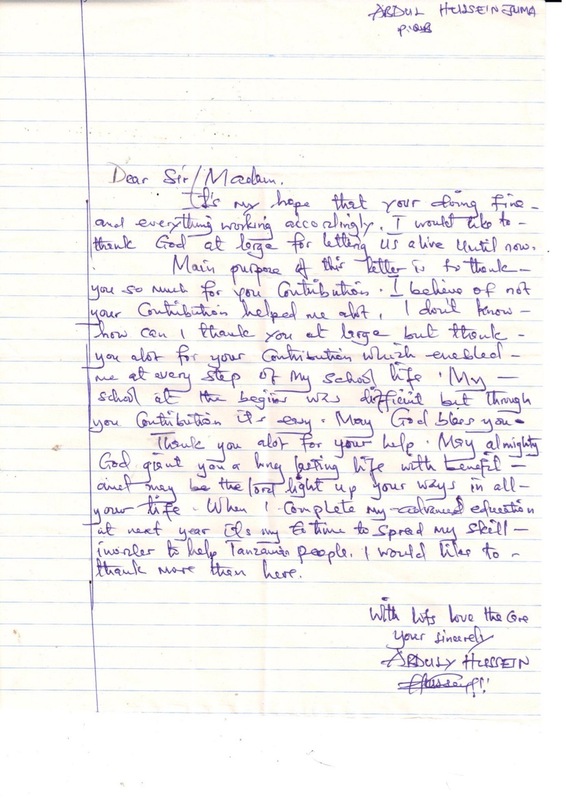 Below is a recent letter, thanking KEF for their sponsorship to complete his Secondary Studies. He plans to enter College after finishing his studies and hopes to become a Doctor. KEF is looking for sponsors to help him continue on this journey. Rehema Oldiani is a graduate of Ganako Secondary School and graduate of the Tanzanian Librarian Training School. She is the Librarian at Ganako Secondary School. 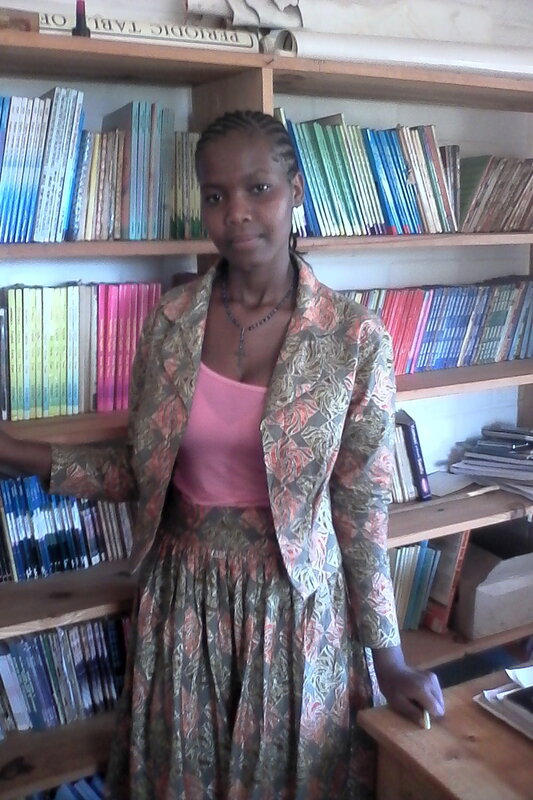 KEF assists the school to pay her salary in order to have a trained librarian available for the community. We are currently looking for sponsors to assist with the librarian fees. Maura Daniel Nyanga completed her University degree in July 2018 and is currently going on to advanced University Master Degree studies.